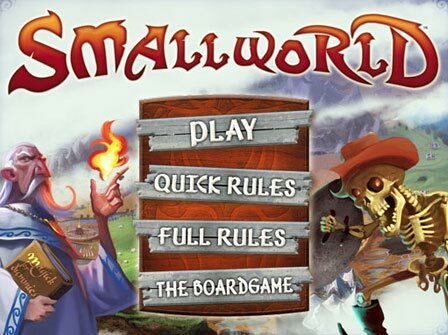 Small World is an award-winning fantasy game where players vie for conquest and control of a world that is simply too small to accommodate all of the zany races such as dwarves, wizards, amazons, giants, orcs and even humans that inhabit it. 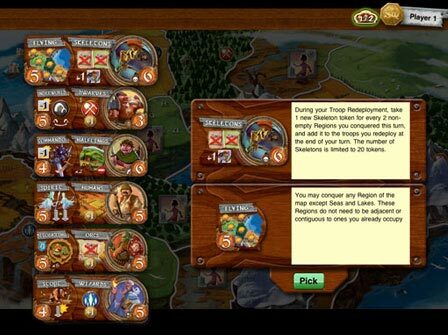 Sitting across from each other around the iPad, or playing in solo play mode against the game's built-in artificial intelligence, you will use your troops to occupy territory and conquer adjacent lands in order to push your opponent's races off the face of the earth, in this rip-roaring fun digital board game. This game actually turned me own to the idea of playing more board games on the computer/tablet. It’s very well done, all the information is handled by the computer, making it easy to learn and plan. Really, the only problems I have with this are the features that revolve around the actually game play. The game has character. Every race looks unique and even the ugly ones are cartoony and fun. The map is colorful, the spaces are are all broken in weird shapes, it really is charming. As a computer game, it all translate great. Very clean, the colors pop and it never looks cluttered with information, even when the board itself is full. The interface is also great. It’s simple and everything is presented where it needs to be. Starting a game is no problem and you should be able to find whatever you’re looking for. So, this could be for two groups of people. If you own the physical game, but want to play more than your gaming group allows, this would be a good purchase. You can start a game with strangers, your friends who also own the digital version or the A.I. Or, if you don’t own the physical game, you might actually prefer this version. It takes up zero space in your closet, you can always find a game, and learning with this game is no problem. Since it’s cheaper than the actual board, it might be easier on your wallet as well. You could buy this for you and a friend for half the price of a physical box. Player-wise, if you like strategy and constant player-interaction, this might be for you. There’ no passive-aggressive strategy that’s going to last ten turns here. First, it was a gift. But that doesn’t mean I had to download it or play it as much as I have. It’s a fun, quick game that doesn’t require to much commitment to start up. If I’m ever itching for the board game experience and this is my only option, it’s a nice option to have. That said, I don’t love the game and I’m glad this was a gift. I was thinking about getting the real game but after playing this, I’m happy I didn’t. There’s a lot of information that the computer takes care of that I wouldn’t have been thrilled to deal with a large group. But even with that, I can’t work through the strategy like I wish and the huge amount of races, while helping the replayability, keeps me from fully grasping the game. You’re experience might differ, especially if cluttered, warmongering, landgrabbing games are your jam. Right now, I only like it. The ever-hungry pillaging halflings have just occupied these hills only to be driven out by the berserk dwarves looking to reclaim their lost mines. Are they going to be able to keep control of it or are the flying amazons going to swoop in to steal their territory? Hilarious fantasy race depictions get multiplied by a variety of special powers to create a multitude of conquest scenarios in Smallworld – a light strategy game perfect for your tablet. A map of a fantasy land lies before you – it is divided into a series of regions – lakes, fields, mountains, forests – many with special features like underground tunnels or magic deposits. Two to five players play as rulers of a series of fantasy cultures that aim to conquer and hold these regions, scoring points to become the most prominent civilization after a predetermined number of turns. The races are created from two components – the base race and a special power – so that your elves can be either of a forest variety, seafaring or perhaps able to tame dragons. The race/power combinations are randomized for every game, giving the combinations of 14 races and 20 powers a ton of potential outcomes. The race and power determines special rules that apply either in terms of scoring points (forest races score extra for occupying a forest) or for combat resolution (heroic cultures are resistant to conquest). It also determines how many tokens corresponding to your chosen race you get, so more powerful races like dwarves will be less populous while the vile ratmen have nothing going for them except for the fact that there is a ton of them. The players then take turns spending their tokens to conquer regions – more or less tokens may be required for conquest of special terrain (mountains) or regions containing defenders from other civilizations. A small bit of luck is represented in that the last conquest is aided by a die roll that can allow victory even with insufficient forces. Once the conquest is finished, troops are re-distributed for best defense, the player scores points for the regions they occupy and the turn goes over to the next player. The game inevitably comes to a point where your civilization reaches a point where it’s spread too thin and further expansion doesn’t make sense – then it’s time to put a race in decline and pick a new one from the constantly renewed selection available to all. The tokens of races in decline get turned over and lose most of their special powers, however continue to score points as long as they hold down their regions. Smallworld is all about two things – calculated conflict and keeping a multitude of effects in mind, introduced by the crazy mix of races and powers (I think peace-loving wights are my favourite). The conflict was always very well rendered in the physical form of this game, but the bookkeeping could turn messy. This is where the digital implementation truly shines. The technology neatly takes care of all the things you would need to memorize like keeping track of how many tokens you have left or how many you need to conquer this region with all the factors in play or how many points you score at the end of the turn. The effect of the multiple effect in play was usually that the game would overstay its’ welcome a bit. It would be especially harmful since sometimes the winner would be obvious a few turns in advance. The digital version in contrast plays extremely fast and is super satisfying in solo mode, playing against 1-4 competent AI opponents. It really helps the game’s longevity that strategies for games with lower or higher player counts are very different and you need to adapt to what your opponents are doing. The graphics are extremely pleasant – you might not have a lot of action on screen, but whatever is rendered is beautiful and a pleasure to look at. The presentation and interface are generally strong points of the game, running fast, having options to skip viewing AI turns and generally offering a smooth and enjoyable experience. The information on all the races and powers is presented in an accessible way, so are numbers of tokens required to conquer a region. The technical implementation truly gets top grades for this one. In addition to playing against the AI you can test your mettle against other human players either through pass and play or through online games. The pass and play functions very well as there is no hidden information in the game. The online play decreases the game’s dynamic flow and is less enjoyable, but gets the job done. The base game gives you ton of variability with combination of 14 races and 20 special powers – for a few bucks more in in-game purchases you can unlock expansions broadening the options even further. All in all – this is a very successful conversion of a board game into a digital format – it does not lose anything from the core game experience and streamlines the gameplay greatly. Compact, very appealing and easy to learn – Smallworld is a great dose of board gaming to take along on your favourite tablet. 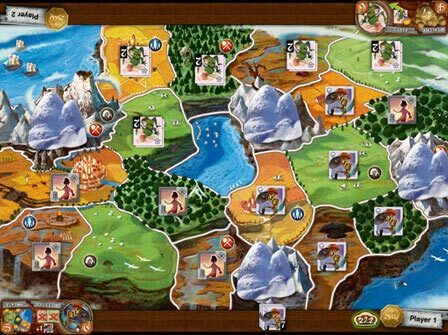 Smallworld 2 is available for iOS and Google Play for around $8. This game is fun and fairly straight forward. As far as tablet games go its pretty decent and suits the medium well. I play this on a 7″ tablet but think it would suit a larger tablet. 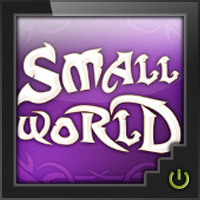 Much of the charm and fun of Small World is lost in the digital version, especially when playing against the AI. The fun of Small World is grabbing regions from your friends and seeing there dismay as you vindictively remove there counters with a decent race/power combo. You can, in theory, achieve this with the digital version (pass ‘n play) but in reality it’s nowhere near as fun as the real thing. As one of the other reviewers has stated it’s pretty pricey at $6.99, and unless you know the game and really are a fan, I would probably say save your money. Put the money toward the actual game! I picked up the iPad version the week before I got the physical game, and by the time the game arrived, I understood many of the nuances of the game. This is a good adaptation of the board game.